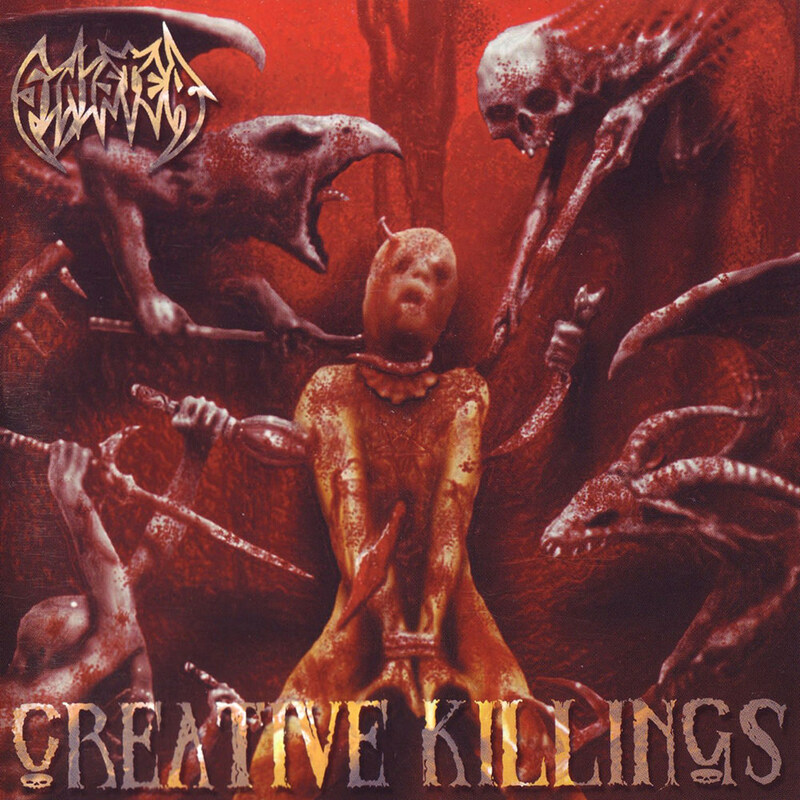 By the time “Creative Killings” arrived in 2001 Sinister was well underway imploding, creatively as well as in terms of membership. Previous vocalist Eric de Windt only lasted that one album, and in his stead Aad Kloosterwaard had installed his girlfriend Rachel Heyzer (who sung for Belgian early death metal group Pathology, but would truly make a name for herself fronting Dutch death/thrash outfit Occult). This was the last record for long-time guitarist Bart van Wallenberg, and the second sign of decline of what once was Holland’s most promising original death metal act. “Creative Killings” is anything but creative – and the murky Jon Zig artwork is only a signpost of deeper creative decay. The first sign of trouble comes with the throwaway acoustic guitar intro track ‘Relic Of Possession’, and the fact that this is a loosely conceptual undertaking about “a different motivation why someone is able to kill and murder a person” according to the newly installed Alex Paul (bass guitar), who was responsible for all the lyrics on the album. On all fronts the record is a continuation of the New York death metal style the band adopted on the preceding record. At best it sounds like a budget Suffocation knockoff, at worst it sounds like Sinister doing their utmost to get signed to California specialist label Unique Leader Records, who were somewhat of an epicenter for this exact type of second-tier knockoffs of bigger, more established death metal brands, musically as well as conceptually. For a band that used to sound unique and have a distinct voice of its own, this record sounds nothing but artificial and artistically hollow. This is not Sinister, but a carbon copy of the New York death metal record seen through the lens of European metal sensibilities. “Creative Killings” isn’t bad in itself, were it not of how much of a directionless and uninspired retread it is of a sound the band didn’t properly master on the earlier mentioned “Aggressive Measures” album. The only aspect that even remotely stands out is attractive frontwoman Rachel Heyzer, who grunts and growls like a female George ‘Corpsegrinder’ Fisher. Even by early 2000s standards the record sounds confused as to what it wants to be. On the one hand the music’s basic template is clearly constructed from the viewpoint of an early Sinister record, yet everything superficial and direct about this record seems to aim itself at a Suffocation and Deeds Of Flesh audience. As a creative gamble, it doesn’t pay off in the slightest as the foundational template is in opposition of what the more direct New York death metal branch seeks to accomplish. This results in a record that is stuck in the past, yet longs to be part of an emerging subbranch of the style of which it fails to understand the subtleties that make it work. It is not until the fourth track ‘Judicious Murder’ that the real Sinister finally surfaces. ‘Reviving the Dead’ is a faceless blaster for the majority of its running time, yet the slow break makes it sound better and more atmospheric than it actually is. The acoustic guitar in the closing section recalls the band’s third album “Hate” in a number of ways. ‘Early Gothic Horror’ is another slow crawler in the band’s original style, it is the highlight of the album that arrives at just the right moment: the middle of the album. ‘Moralistic Suffering’ starts with a riff that is surprisingly similar to the opening riff from ‘Embodiment Of Chaos’ from the “Hate” record. Keen observers will have noted that ‘Bleeding Towards the Wendigo’ and this track have identical running times, although similarities seem to end there. ‘Altering the Beast’ is wholly steeped in Suffocation worship, and in terms of construction it is closest related to “Aggressive Measures” signature tracks ‘Behind the Superstition’ and ‘Chained In Reality’. Unlike those tracks the song is mostly on the slow side, and the technicality doesn’t sound overbearing. Of note is that ‘Altering the Beast’ is custodian to one of two guitar solos on the album, and it is sadly memorable only because of that. ‘Season Of the Wicked’ is the last original track before a cover rendition of Possessed classic ‘Storm In My Mind’. ‘Season Of the Wicked’ sees Sinister trying its hand at aping Polish rising stars Decapitated with its choppy, nervous riffing and more open-ended song construction. Towards the end the second guitar solo of the album is introduced, and while these are hardly memorable in its own right, it begs the question why Sinister only decided to use them in of two tracks. The Possessed track is faithful enough to the original, and the presence of guitar solos in this cover once again begs why Sinister not write more solos for its own original material. The production is similar to the Thanatos album “Angelic Encounters”, on which Aad Kloosterwaard also provided drums, that was released a year earlier. The artwork is typical Jon Zig, and although it is one of his better works it still is no match for the classic paintings of Dan Seagrave, Kristian Wahlin, Kris Verwimp or Axell Hermann. While “Creative Killings” is the least creative Sinister album up to that point, it is leagues better than the record that would follow in the footsteps of this one. Those who want to sample Sinister’s music are advised to check out “Cross the Styx”, “Diabolical Summoning” or the band’s third and most conceptually complete record “Hate”. At the helm of this revised version of Sinister was vocalist Eric de Windt, and his vocals are quite similar to those of original frontman Mike van Mastrigt. The only real notable difference is that de Windt’s grunts are far less deep. Aad Kloosterwaard does his best Dave Culross impression, and the nervous, choppy and crawly riffing takes equal inspiration from Suffocation this time around. Alex Paul provides bass guitar, but he is felt more often than he is actually heard. On all fronts “Aggressive Measures” sounds like a band desperately wanting to stay revelant, but only partly succeeding. By abandoning the style that made them the force they were, the band excises their only identifiable trait and replaces it with a sound countless of other acts around the world were doing. The biggest stylistic departure is just how mechanical this record tends to sound. Whereas earlier Sinister records found an equilibrium between blasting fury and creepy midtempo dirges “Aggressive Measures” aggressively removes the band’s past template in favor for the taste-of-the-day, and the results are mixed at best. This is still Sinister at heart, nobody is able to replicate the band’s signature melodies or Aad’s weirdly unconventional drum patterns, but all else screams Suffocation worship. The bass guitar, once a focal point in the band’s writing, here is relegated to a mere supporting role. For a band once so proud to carve out its own sound, this certainly sounds timid and docile. It begs the question why the band decided to overhaul its sound quite so drastically. Kloosterwaard surrounds himself with capable musicians, but his influence can only have been minimal, as this sounds nothing like the Sinister of the previous three albums. That isn’t to say that “Aggressive Measures” doesn’t have it share of signature tracks. ‘Beyond the Superstition’ and ‘Chained In Reality’ are probably the best this record has to offer, and the most clear in the Suffocation worship. There isn’t anything really wrong with the record, other than it being an imitation of something better, something more poignant. It is understandable why Sinister decided to go for this route. Suffocation released the “Despite the Sun” EP, their swansong. Krisiun (from Brazil) was making a name for itself in the underground, Diabolic released the utterly pummeling but derivative “Supreme Evil” and Morbid Angel released “Formulas Fatal to the Flesh”. The old death metal ideal was being left behind by its key players, and even second-tiers as Sinister felt the claws of irrelevance if they not kept up with the times. The problem isn’t so much the Suffocation influence, but that it pushes out what made Sinister unique in the first place. All traditional Sinister components are still accounted for, yet their presence is minimized in favor of letting the Suffocation worship flourish. That isn’t bad in itself, but when people want to listen Suffocation they’ll grab one of their own records, and not this half-hearted, watered down stab at that particular sound. Other than that the Suffocation and Sinister elements feel out of place next to each other. The strength of Sinister was that it didn’t sound like the stereotypical Florida or New York band of the time. “Aggressive Measures” was a bid to get a footing in North America, and in the process Sinister betrayed its European fans. This is a confused record from a band that is suffering an incredibly obvious and painful identity crisis. After recording three albums in Germany for the first time the band holed up at a studio in Holland. Excess Studio in Rotterdam was chosen for the session with the duo of Hans Pieters and Vincent Dijkers producing. The band envisioned to work with American artist Wes Benscoter. Alas they ended up working with Thomas Ewerhard as Benscoter was tied to other commitments at the time. 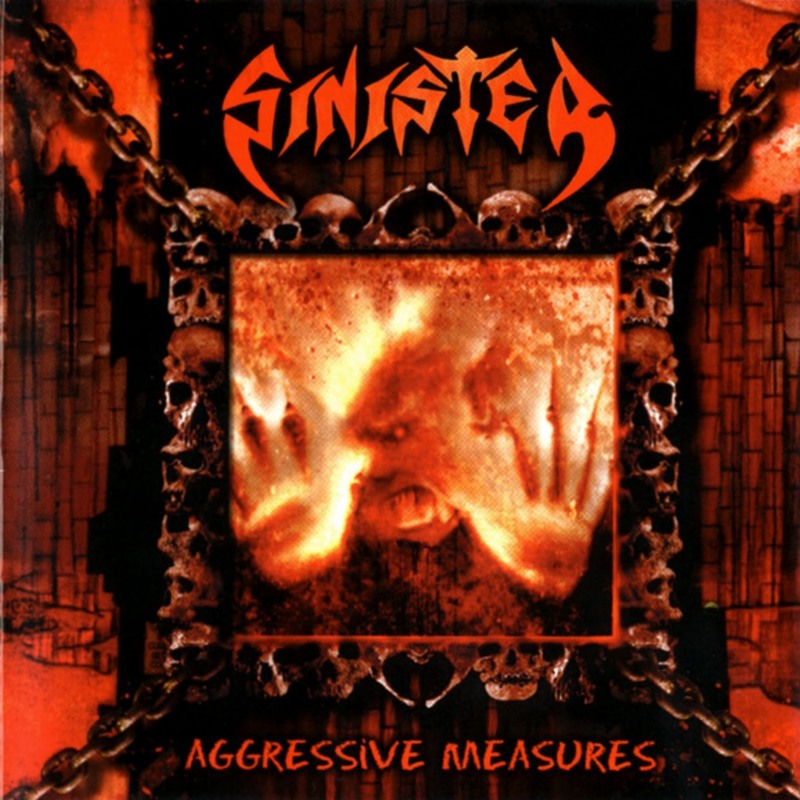 In all “Aggressive Measures” took aggressive measures to modernize the Sinister sound for a newer and younger audience. It is a solid, but unremarkable record for a band that never really outshone any of its regional competitors in the same genre. If you ever wonder what New York death metal sounds like when produced by a few guys from Holland, this record is a good place to start.